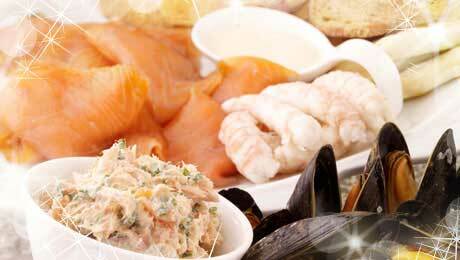 A fantastic starter for seafood lovers. Prepare the sauce by placing a bowl over a simmering pan of water. Add the egg yolk and water and whisk until light a fluffy. Add the remaining ingredients and store in the fridge (up to a day or two max). Serve with fresh crudités i.e. carrot batons, cucumber batons, celery batons and apple slices. Melt the butter in a small pan over a medium heat. Add the shallot and allow to cook for 2 – 3 minutes until translucent. Pour the butter and shallot mixture into a food processor and add the smoked and baked salmon, pulse lightly until the fish is coarsely chopped (do not overblend or it will become paté-like). Using a spatula, remove the salmon mixture from the food processor into a large bowl and add the créme fraiche, chives and lemon juice. Firstly wash your mussels in some fresh cold water, debeard and remove any debris. Do not use any mussels that do not close when gently tapped. Drizzle some olive oil into a large pan and add the onion and garlic. Allow to cook for 2 – 3 minutes then add the cleaned and unopened mussels and a splash of white wine to introduce vapour to steam and cook the mussels. Allow to cook for approximately 5 – 8 minutes, the mussels are ready when all have opened. Do not use any that do not open. To finish the dish add the cream and some finely chopped herbs, serve with some lemon wedges and nice crusty bread to mop up the juices.